I just finished this 5E3 Amp. and not only it works, it sounds great and looks good! 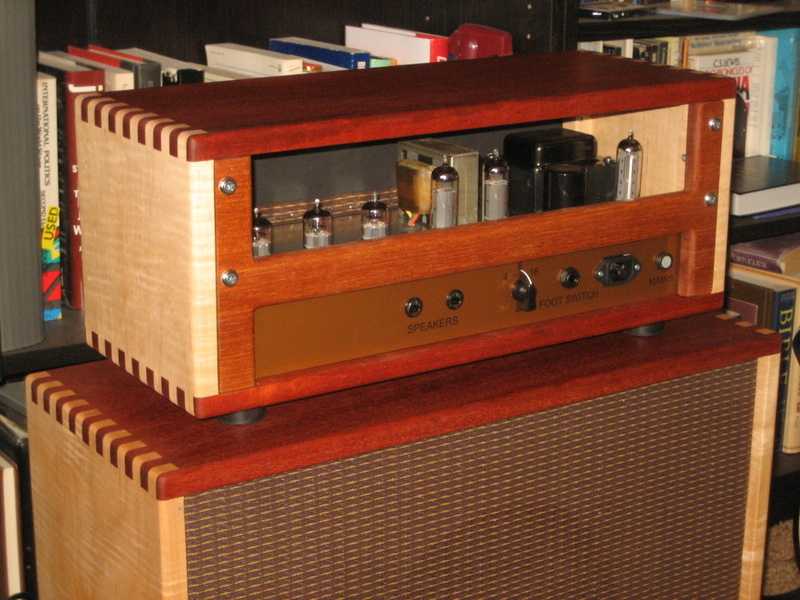 This was my first amp building project and the process was lots of fun & thrill. The assembly manual that you provided and the video are so thorough and helpful in completing this project to a success. The packaging of all components are all so well organized and make it easy to find amp components. Your staff is also so helpful in replacing missing parts (resistors). Thx! Overall, it was a wonderful experience and I highly recommend musicians to get amp kits from your shop!! 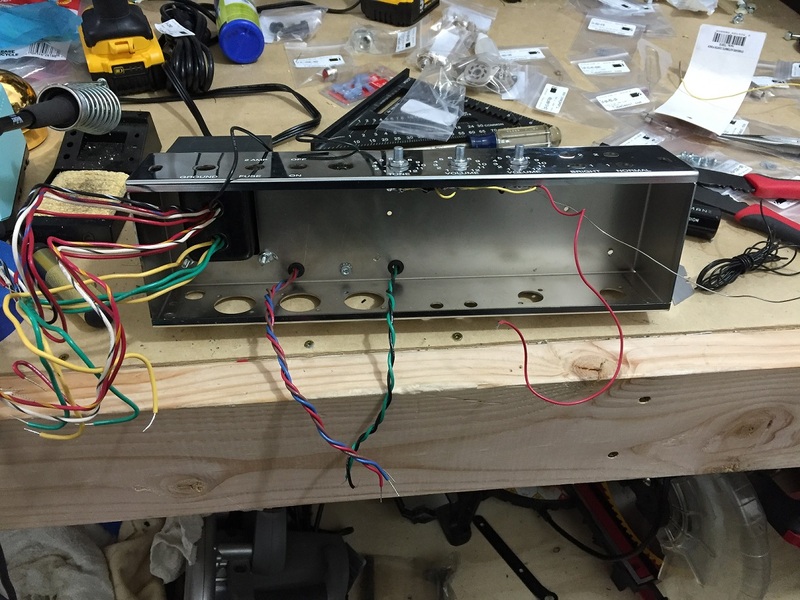 Moving forward, I just started my second amp. 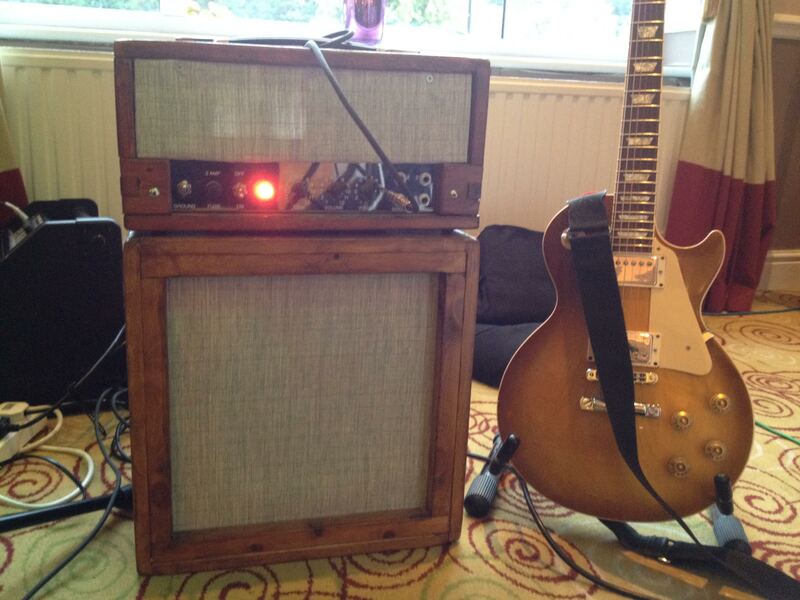 project, British 18 watts combo! Buy this Tweed 5E3 Kit. 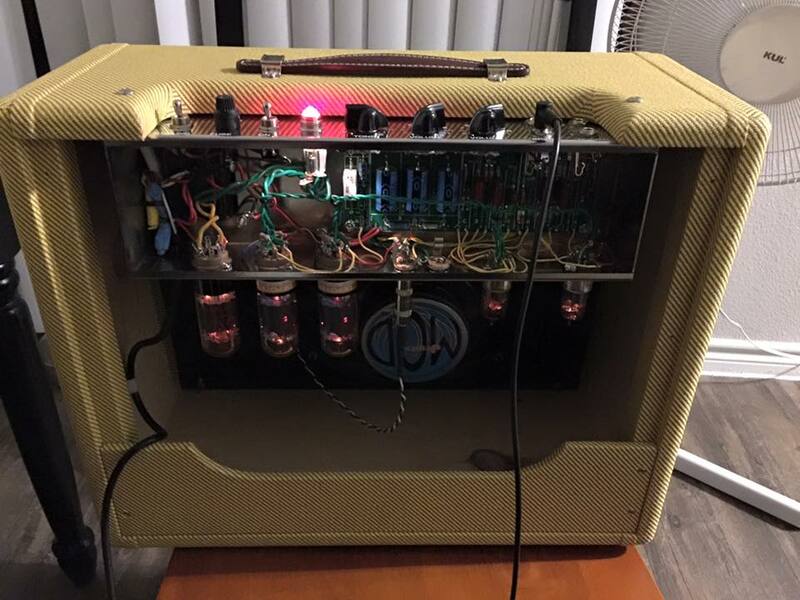 This is my first amp build and while I’m experienced with electronics, I wanted a complete kit to try my hand out at amp building. I really like the circuit and PCB TubeDepot has come up with and the kit arrived fast. The instructions are top notch and there is a lot of help on the web for these builds as well. The sound is perfect as far as I’m concerned and the amp sounds just as good alone or with a pedal or two in front of it. The only little extra thing I did was install a female 3 pin header connector on J1 on the circuit board and ran 3 wires to a spdt switch I mounted between the 2 preamp tubes to switch the feedback circuit in or out. It worked well and is a nice extra. I recommend trying it. 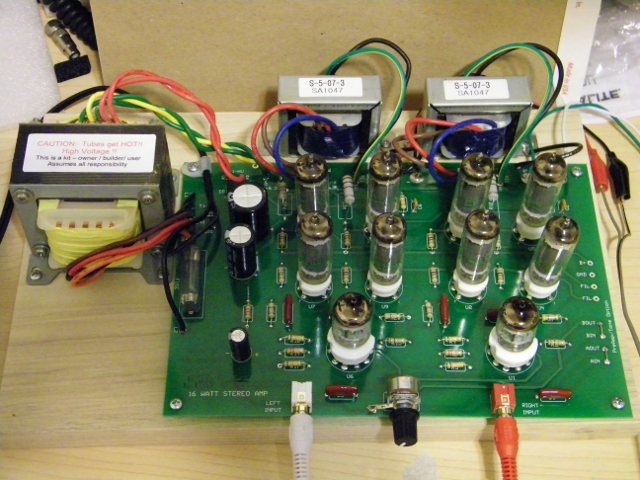 In any case, if you’re thinking about building your own amp, please try this 5E3 kit from TubeDepot! You won’t be disappointed. Also, they go on sale every so often. I bought mine on the Halloween sale this year. The normal price is already awesome but on sale, I couldn’t pass it up. I loved building it. The directions were very detailed and helpful. The kit itself is well organized and high quality. I was only able to work on it off-and-on since I'm also remodeling my house. But I just kept chipping away at it when I had a chance. I only made one mistake which was easy to correct. The amp sounds fantastic! This video doesn't do it justice. That slight tinny sound you can hear in the background is from the cymbals of the drum kit (the amp is making them vibrate). Overall, highly recommend this kit to anyone who wants a great amp at a reasonable price and can carefully follow the very good directions. Thanks TubeDepot.com! I'm already looking forward to buying my next TubeDepot kit. 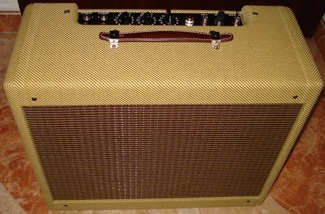 Thanks for supplying such an awesome Tweed Deluxe kit. I couldn't be happier with the finished product. This was my introduction into building amps and your instructions made it possible. 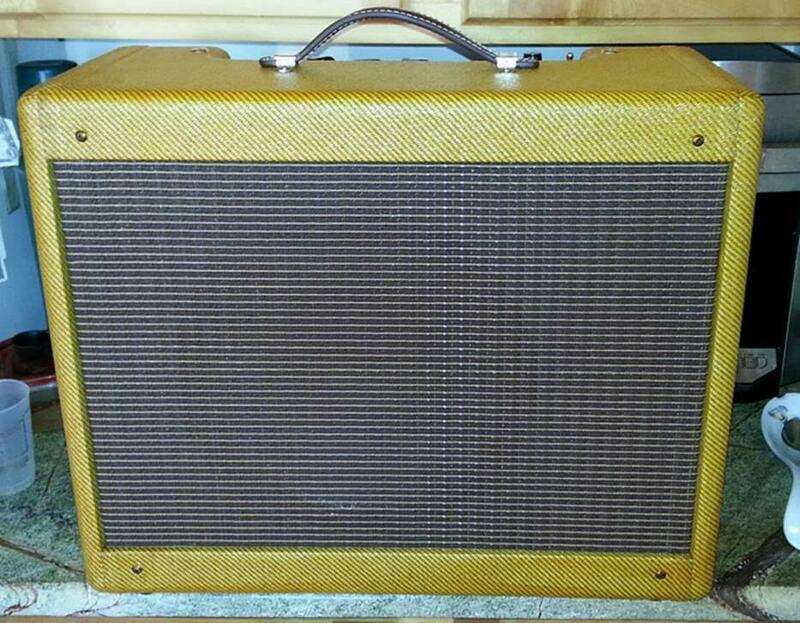 I also own a 65 Deluxe Reverb and a 73 Super Reverb... This amp is a fantastic addition and may be my "Go To" from now on. It won't be my last build from you! I just want to say how fantastically pleased I am with the now-complete 5E3 kit!! I'm really blown away at the quality of the components and the instructions, the overall design, the performance, and also your informational videos on YouTube.... you guys did a helluva job on all counts and I'm extremely thankful. I'm singing your praises far and wide, I promise. 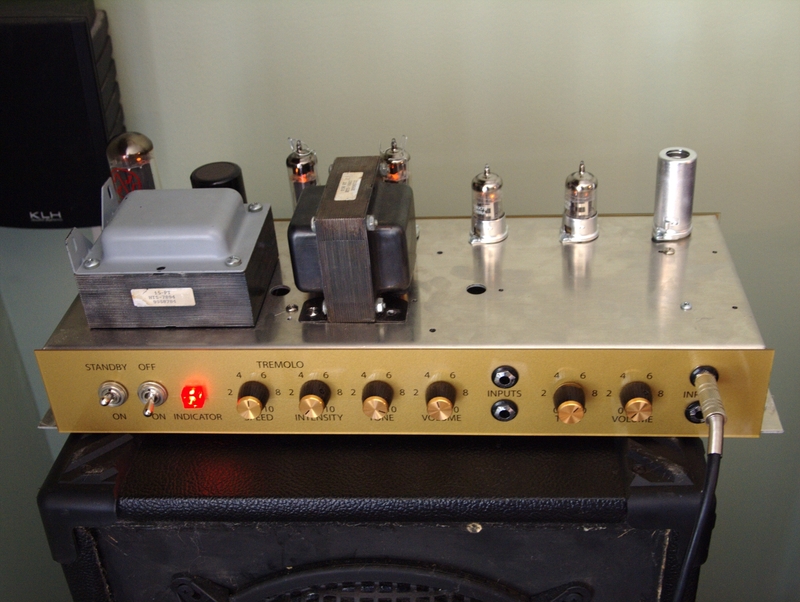 This amp kit was my entry into the tube amplifiers. The build instructions are almost perfect and very easy to follow. The assembly was done pretty fast for such kind of project. 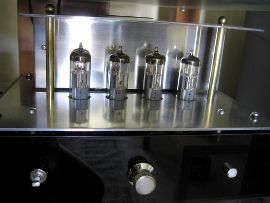 I have to say tube amps are a completely different world and it took me a little bit to get used to it. But what i got is an amp which is alive. Never felt like this before and i don’t want to miss it anymore. Buy this Tweed 5F1 Kit. Just finished my Tube Depot JTM45+ kit and couldn’t be more satisfied. The quality of the documentation, photos, and the kit itself was first-rate. 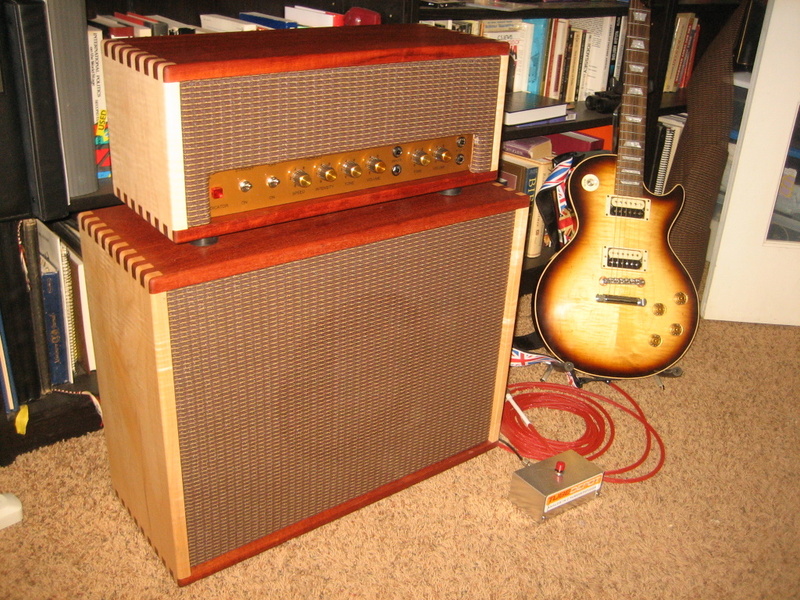 This was my first ever amp build but made no mistakes and the amp just sounds great. 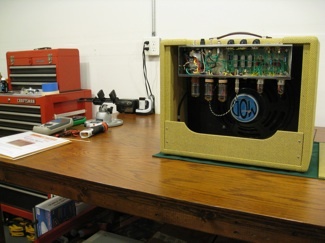 Buy this Classic British JTM45+ Tube Guitar Amp Kit. 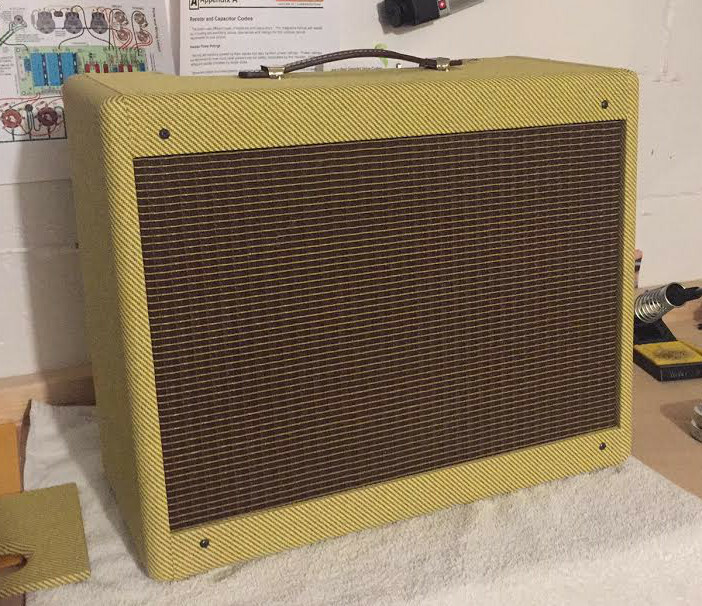 This is the first attempt at building an amp and it turned out great! Blows my Hot Rod Deluxe out of the water! I had such a good time building it that I ordered the 18W British Classic today!! 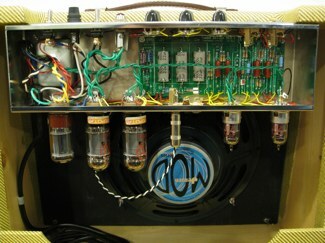 Buy this Tweed 5E3 Vacuum Tube Amp Kit. 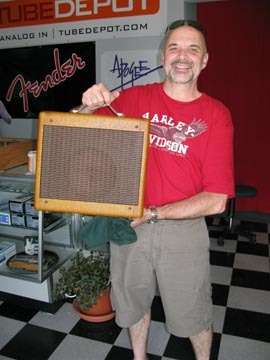 I've built several amps over my life. Nothing like this 5e3+ Kit. Words cannot describe how amazing this amp sounds!!! No hum no buzz no noise. 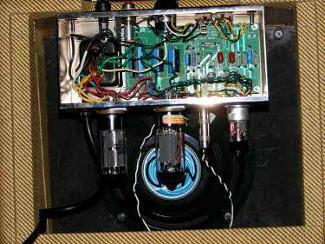 Other amps I built I always just pieced them together and substituted spare parts. Mostly from AX84 website schematics and my dad's tube radio supply/tube TV repair stockpile of parts. 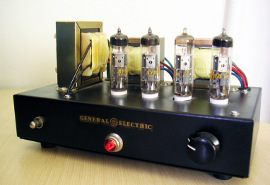 Single Ended tube rectified EL84 amp with a 6X4 rectifier. 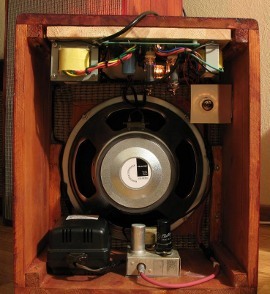 Then I made a push pull EL84 mini Plexi with a 6CA4 rectifier and master volume. 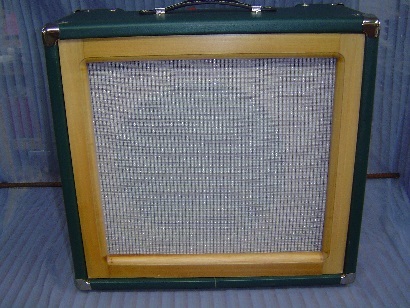 Then I made a Fender Champ clone head. As of late the desire for all hand wired circuitry and tube glow infiltrated my mind. I ordered this kit. 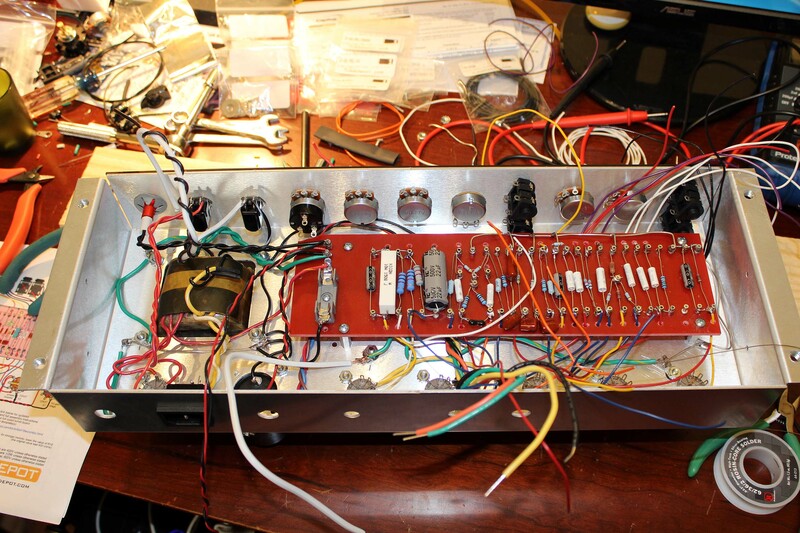 I now have a new passion for building amps. You guys put together one heck of a kit. Thank you soo much for all of the mod advice and options. 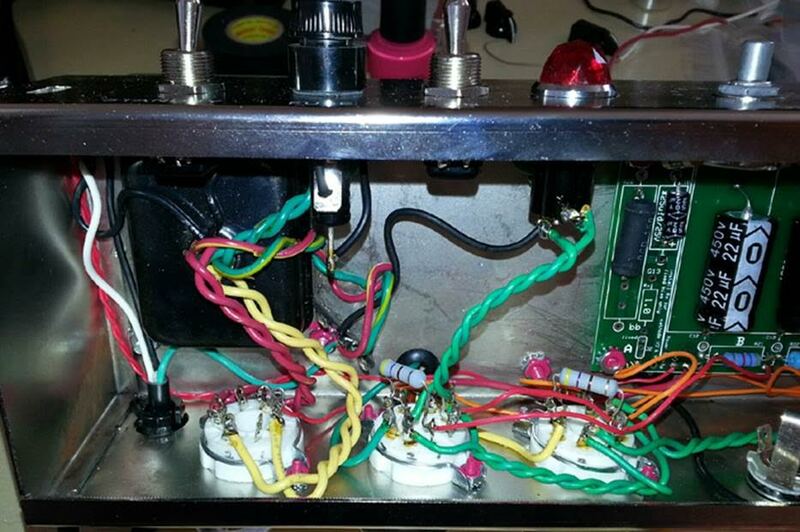 I plan on making this amp fixed biased with your 10k bias pot. mod. 5Y3 rectifier for more sag and lower plate volts. 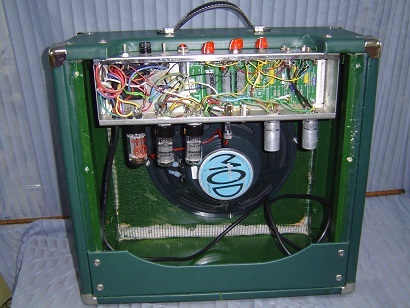 I will also experiment with master volume and cascading gain mods. Enough talk here are some photos!! Plate volts after 20 minutes 420 volts. 385 on the screen. Pure tone!! The Build of the cabinets was all solid Mahogany except for the speaker mounting board which is ¾” Baltic Birch with Mahogany veneer. “12” Ceramic Webber Blue Dog”, 16 Ohm, and of course a relatively un-modded Tube Depot 18 Watt British Head. All inlay work on placards and in the tear out of the Mahogany was of real crushed Turquoise stone. Sounds Great! Buy this British 18W Kit. Ordered your 16LS kit from you at the beginning of the year. Awesome kit, sounds great and a great intro to the technology. Just finished designing an enclosure last month and I though you might like to see! 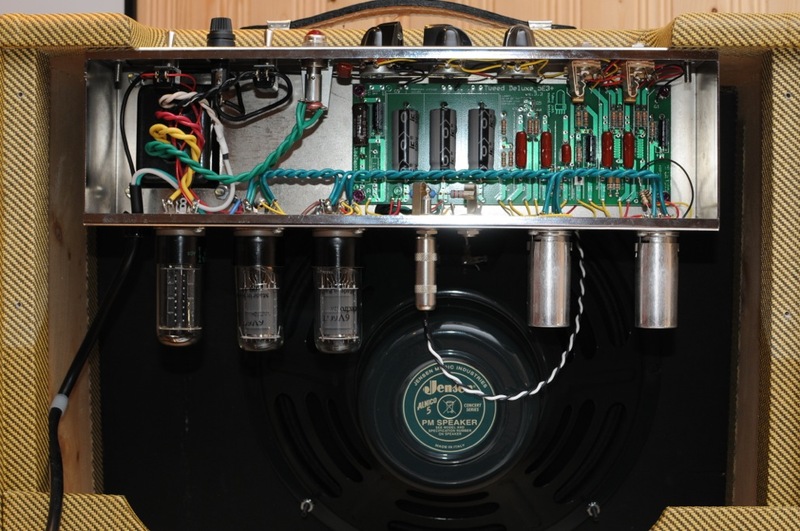 Buy this Model 16LS Stereo Integrated Tube Amplifier. At volume 4 in the bright input it was shaking the walls! I enjoyed the heck out of this project! GREAT directions and the video of the build helped too... excellent job. I've told several friends and one of them asked if I would build him one if he bought the kit, so I might get to do it again! Thanks for putting these kits together. I finished my 5E3 build. My first ever and it sounds great! You guys rock! I want to express a little gratitude for the obvious amount of work you put into your trade. A 5E3 kit arrived at my doorstep yesterday and the finished project is pictured below. It's too late to try it now but all of the testing suggests it's good build. That is in large part due to your excellent instructions. I can tell a good group of engineers work there. Thank you again and know that I'll be back in a few short months for another kit. Your slightly obsessed customer in the making. 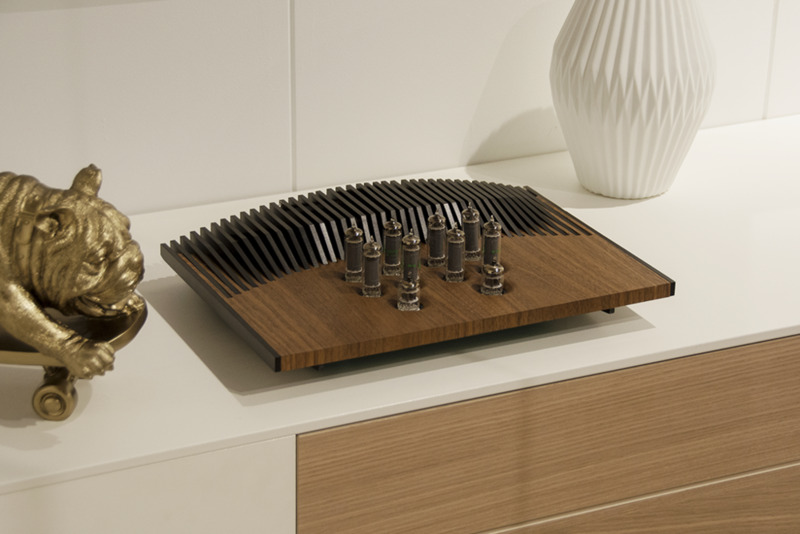 The whole point of this amplifier is musical enjoyment, and it does this in spades. I plug it in, and I can't tear myself away from its mellifluous sound for hours and hours and hours. Its clean, liquid sound just won't let me turn it off. In stark contrast to the dry, boring sound from professional monitoring equipment, the euphonic colorations added by tube power amps make everything sound smooth, sweet and spectacular. The whole point of tube amps is making music sound even better than it was recorded, which this gem does very well. 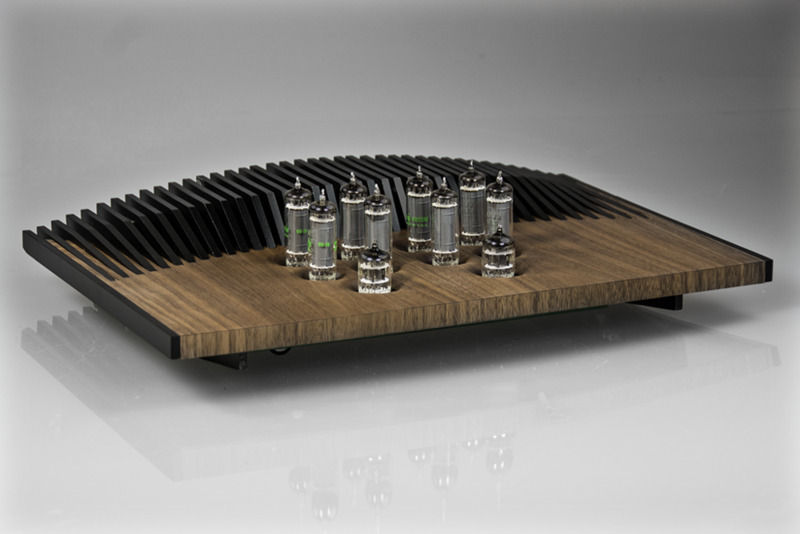 Buy this Elekit TU-8200 Stereo Tube Amplifier Kit. The little system does sound great! I have the Elkit’s mated to an Ashley crossover and a pair of Vienna Accoustic main speakers on the desk and a pair of MK V8 subwoofers under the desk. All the sources (Pioneer PL55D turntable, Pioneer RT909 reel to reel and Sony CD deck) are vintage and at least 20-30 years old. I love the older stuff. 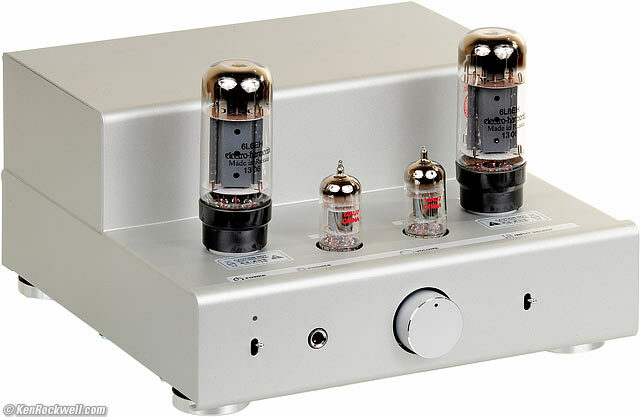 Buy this Elekit TU-8500 Stereo Tube Preamplifier Kit and Elekit TU-8200 Stereo Tube Amplifier Kit. Just finished the JTM-45+. WOW! what an amp!! I elected to do the mods to the Bright Channel for the "Higher Gain/2204" and "tighter" low end you outlined in the schematic. I also did the Post Phase Inverter Master Volume mod you talked about (your design made it super easy to install this mod on the turret board). I was worried that this amp would be a flubby vintage sounding amp, but NO WAY!! I have an amp that can go into Modded Plexi/JCM800 territory with out blinking. 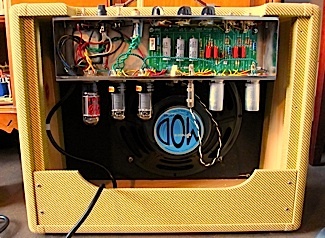 I also want to add how effective the Tube/Solid State Rectifier mod is as well as the Feedback switch option mod you designed.This is a very well thought out amp built on a classic design. I also built your recommended turret tool and it worked great! Your documentation made the build super easy (skill level was designated appropriately) and I appreciate all the effort you guys put into this amp. I plan on doing a video review in my studio as well. 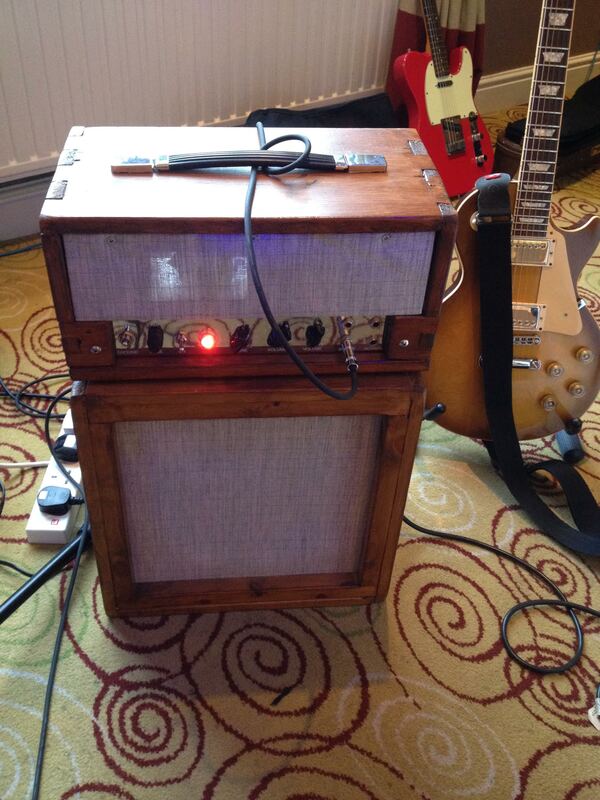 Buy this Classic British JTM45+ Tube Guitar Amp Kit - Head. I just finished putting together one of your 5e3+ kits. I thoroughly enjoyed the whole process. Your directions were super easy to follow and very detailed, which helps a guy like me who has only ever built guitars. It even worked the first time i plugged it in (after triple checking connections, of course)! I've heard some people complain about this amp being lacking in the bass, but I couldn't be happier. I installed an Eminence Cannabis Rex in the amp and have all the low end, and volume, I could ever need. 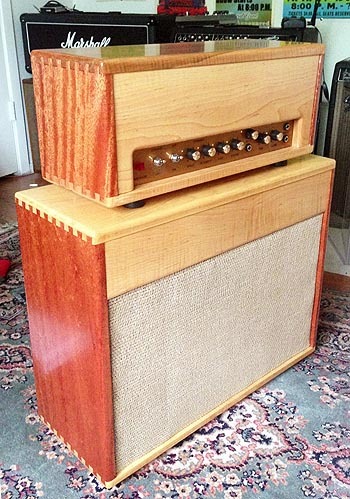 I constructed a finger-jointed pine cabinet of my own design to house the amp. It's a lot like a normal one, except 10" deep and no slant. Next kit is going to be one of your Classic British 18w heads. Thanks for the great kit! This amp is amazing. It’s great for recording and gigging and you can get incredible tone at volumes that don’t upset everybody else! However, that being said, it is pretty loud! This is the perfect build for a beginner too and the instructions were idiot proof. 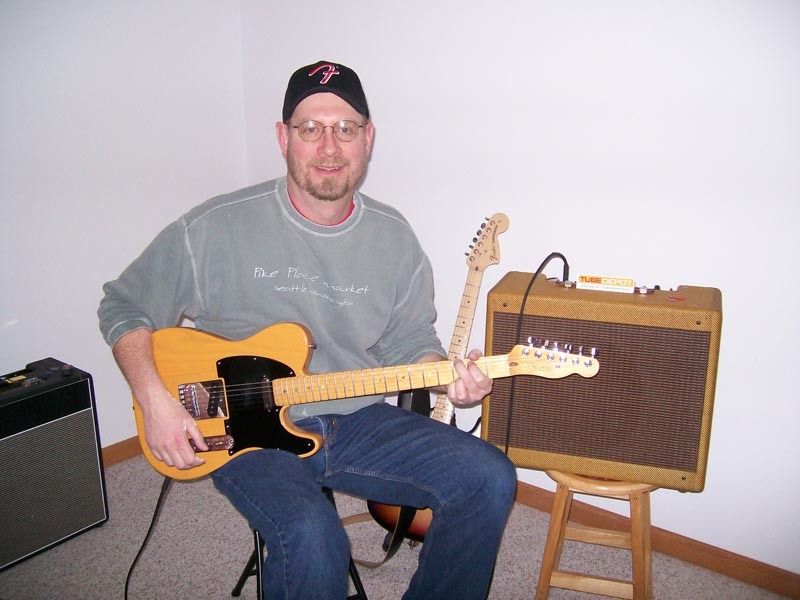 Using it with a Les Paul, my homemade Tele and a 1937 Cromwell Archtop. I'd just like to say anyone looking for quality parts, excellent customer service, and awesome detailed step by step instructions to build an amplifier these guys rock. I built my first amp sourcing everything except the head cabinet(made it myself) and chassis (sourced locally) from tubedepot and I'm more than impressed. I followed the instructions for a jtm45+ build. With the assembly manual accompanied by the video took out any guesswork. This amp is totally awesome sounding and I'm very proud of it. Any questions I had were answered promptly and accurately. Thanks tubedepot. I'm one happy customer. Rock on. 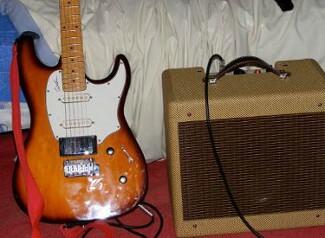 Here are a few snapshot of my amp. 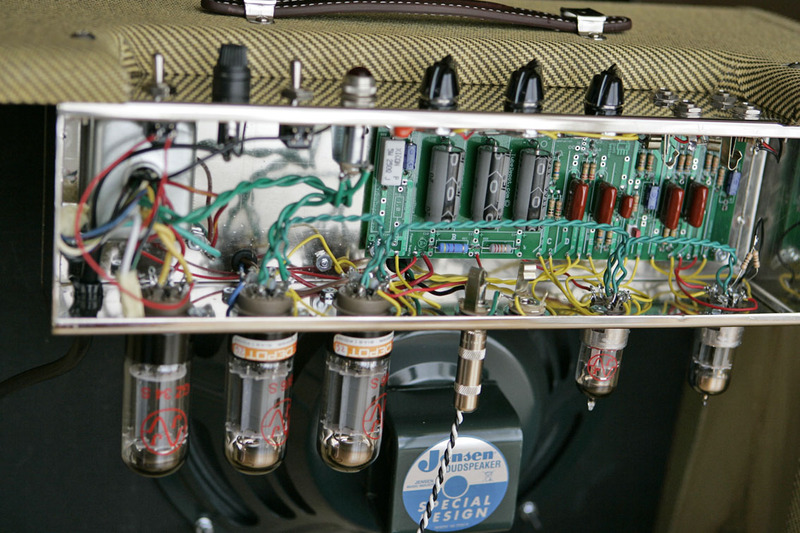 It is a delightful kit ending in a delightful amplifier. As a beginner builder this was a very good kit. I worked with confidence due to your thoughtful packaging and instruction. Thanks for making it right! Zero mistakes by the way! hehehe! I ordered another amp kit from you guys a few months ago. 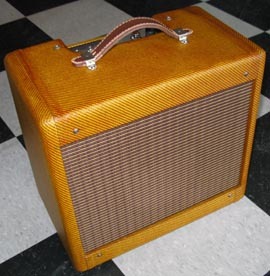 It is the 2nd amp kit I ordered from you. The first build went extremely well, and I was very pleased with the results. It was a 1957 Fender Champ kit. For my next build, I decided to go with one of your competitors for a JTM45 kit because I was trying to save some money during the recession. Their kit was cheaper than yours, but I got what I paid for. Their instructions and schematics for the build were full of errors and were just wrong. 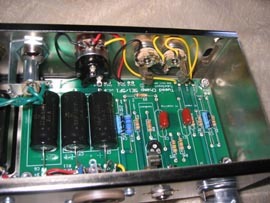 They also sent me defective parts, which complicated the build and made it extremely difficult to get the amp working. They added insult to injury by refusing to send me replacements for the defective parts, and accused me of damaging said parts during my attempts to build the kit with their horrible kit instructions and schematics. In short, the experience was nothing short of a nightmare so I could save a few bucks. I ended up losing whatever savings in dollars I had with their kit in labor and shipping to get the defective parts replaced and get the amp working. This time, I decided to order a kit from you guys, and once again, things went perfectly. I wanted to write a short note to let you know I'm very happy with the products I have bought from Tube Depot, and I recommend your products and services to anyone of my friends and acquaintances who are looking for similar products. 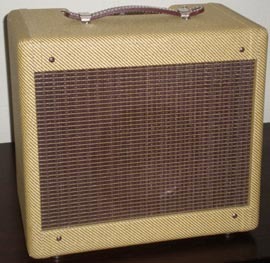 I'm currently using my "Bluesbreaker" combo as my primary amp when playing at home for practice and study, and I love it. It sounds real good. I like the bright input for playing Steel Guitar. 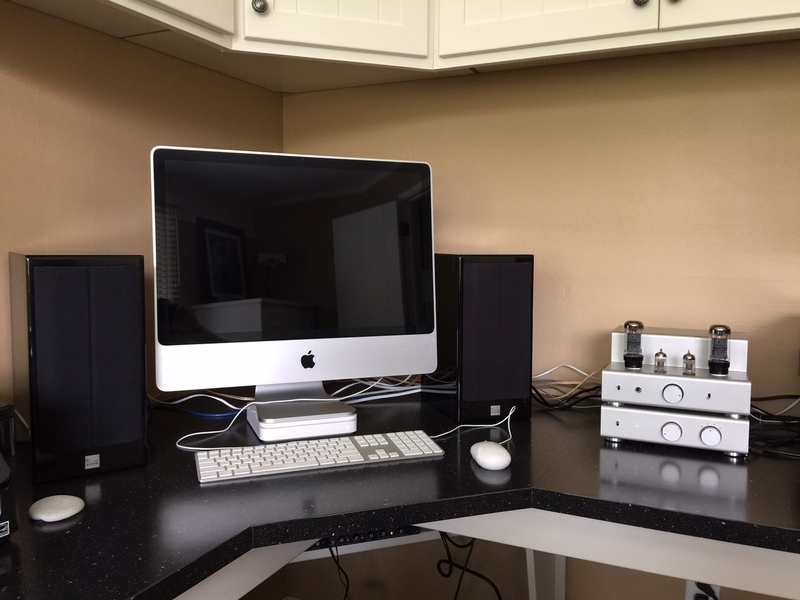 Thanks for providing everything needed to build a great sounding amplifier. 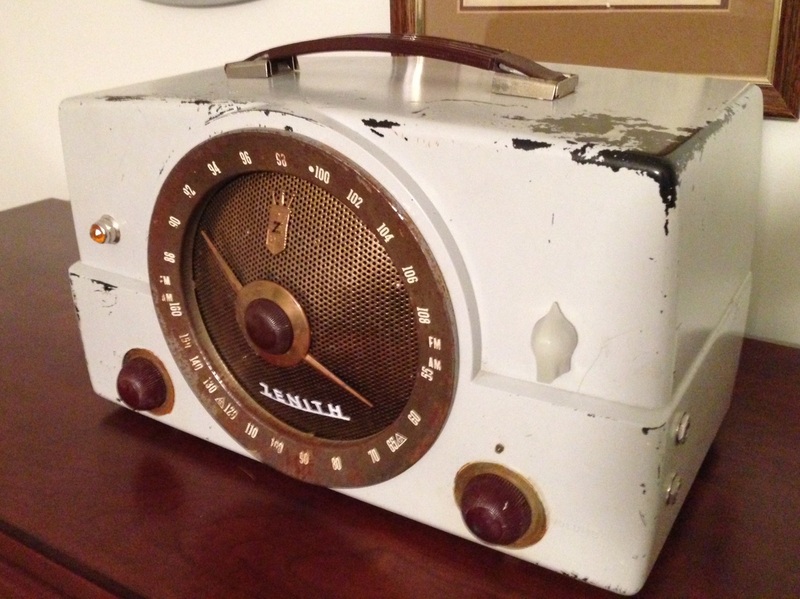 Using Tube Depot parts (Tweed 5F1) I was able to fashion this unique tone monster housed in a well worn 50’s Zenith table radio cabinet. Rob and team: Thanks for designing a superb Tweed 5E3 build kit. It took me three evenings. The terrific step-by-step directions overcame my poor soldering skills and my "measure once cut twice" approach to assembly. 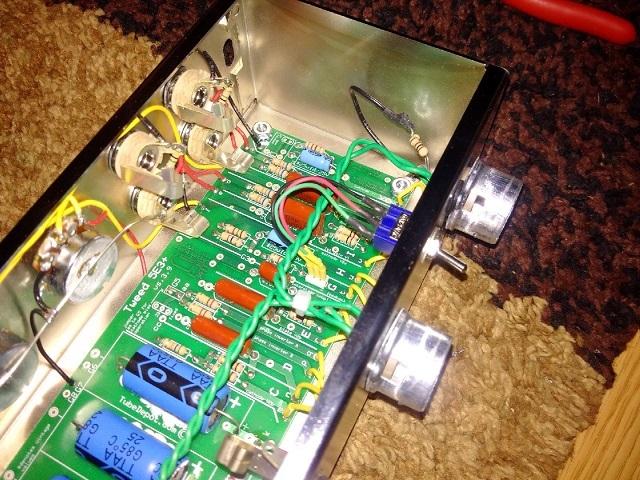 I followed the directions and the amp came out right the first time, without having to go back and trouble-shoot. 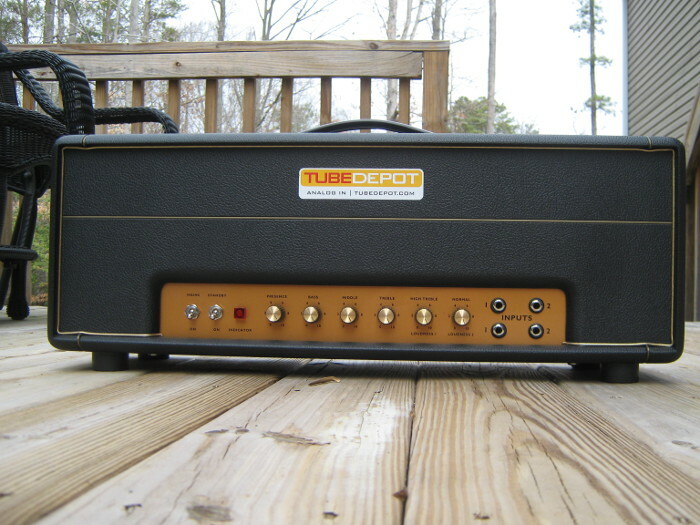 I also installed the optional "brown devil" resistor from Tube Depot...clearly that made all the difference! 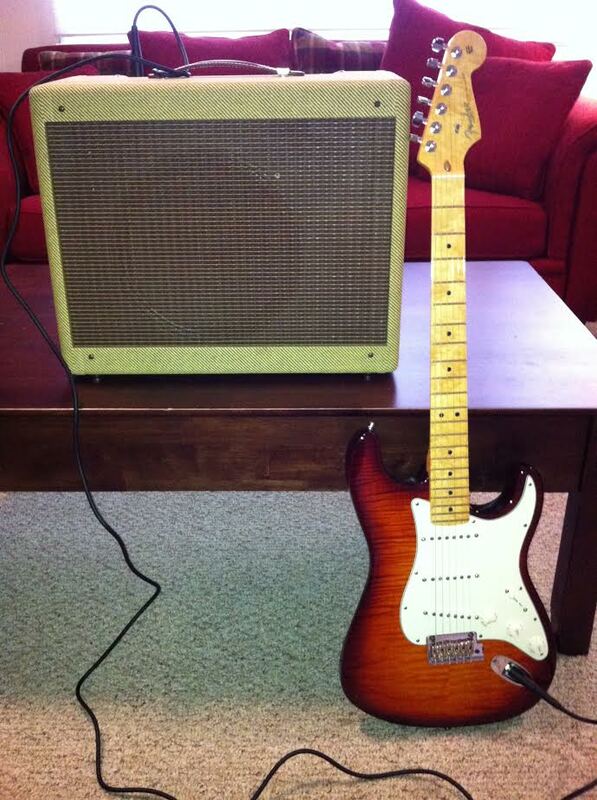 The amp sounds great with the single coils on my strat. Thanks again...I'm a customer for life. 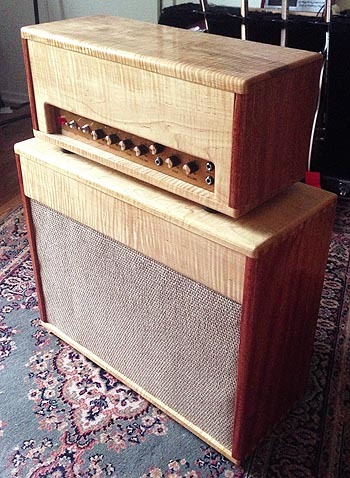 A hand built cabinet for our JTM45+ kit. Isn't it beautiful? Just finished my TubeDepot Tweed 5E3 kit build this morning. I LOVE it. Absolutely the sweetest sounding amp I have ever played. Great, great tone, just the right volume for my music room and recording, sounds great with both single coils and humbuckers, and has absolutely no hum or hiss with either. Exactly the sound and tone I have always wanted. My best guitar buddy just stopped by and played it, and left with a grin almost as wide as mine. I am taking a minute to send you this note, and then I am going right back to discovering what all is in there, sounds-wise. This was my first big project. The kit was complete, and arrived very well packed the day after I ordered it, the directions complete and easy to follow. I built it “stock”, with the exception of using a JJ 5751 I stole out of my “vintagized” Pro Jr (which is now for sale... good little amp, but I know I will never plug it in again now with the 5E3 around...) in preamp 1, and three coats of clear satin MinWax poly. I didn’t want to change the color to orange, just a little protection for the tweed. Very impressed with the quality of the electronic parts, hardware, transformers, cabinet, the chassis, and especially ( and a little surprised, as I was considering a P12 or Cannabis Rex...) your choice of speaker. Thanks for a great kit, and giving me the opportunity to play such a sweet sounding amp on my budget. As always, customer service, and everyone I have talked to or corresponded with at TubeDepot was also top notch. Finished for now. 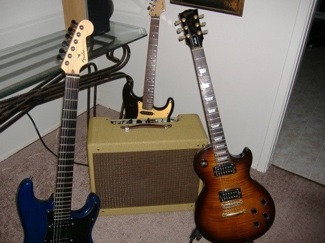 Started when I got some parts from a friend -Marshall 18 Watt Faceplates and a set of West 15 Watt Transformers. Got the rest of the parts from you and used your set and circuit. 1 - Used the EF86 mod, but added a rotary tone switch instead of the standard tone control. (like the EF86 circuit in a Matchless) Now I have both types of "english" sound. 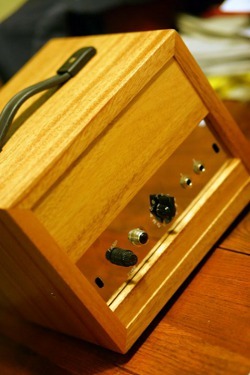 2 - Added a Master Volume but stuck it in the 2nd speaker jack hole to preserve the 4 inputs. Works great and doesn't appear to affect the sound. 3 - moved the tremolo switch jack (the faceplates had both fuses on back) to where Marshall put it on their 18W re-issue, used shielded cable. 4 - added a choke and an octal based rectifier. What a great project. As I've written before, your manual makes this the closest to an old-type Heathkit out there. Almost foolproof, follow the steps and it worked first time. What is really nice is how quiet it is - if you follow your examples and directions. Just compair to how much information MOJO gives. With everything all the way up - no noise from the tremolo channel and only some hiss (to be expected) from the EF86 - can't hear it at normal settings. With some careful wiring and use of shielded cable, no RF noise on the inputs and no "thumping" by the tremolo channel when not being used. 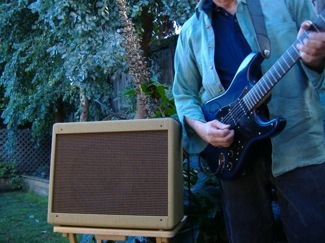 You can't buy a better sounding amp for anything less than double the cost, and it is by far the easiest kit to work on. I have a set of Duncan Vintage Blues in my Es335 and if you want a classic sound - PAF's driving a vintage Marshall circuit, it doesn't get much better. In fact, the Only noise I get that I can't get rid of is a "thump" when I turn the tremolo off. Surprising sound from a "small" amp, especially driving a pair of 12" speakers. I've written about the tremolo off "thump" before and after some research and test I think in the end it was something the original circuit always had the potential to do. I suspect that with more modern tubes and components, it just is "touchy." 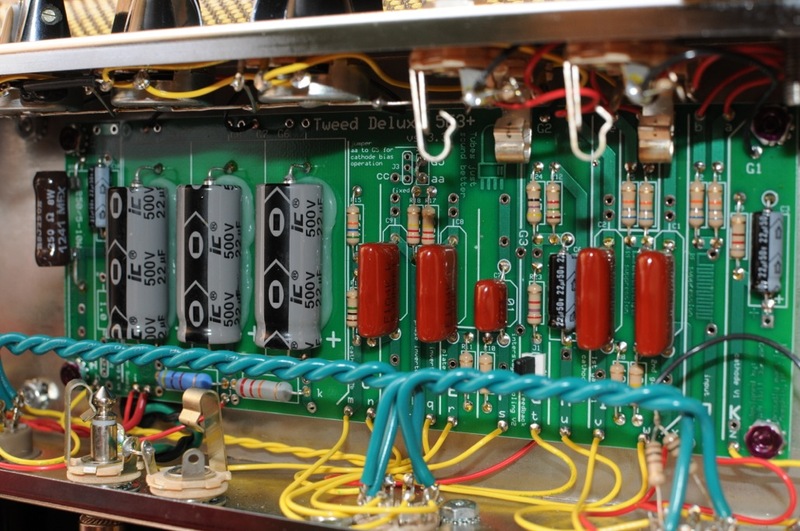 With the change in capacitors and resistors used in your circuit, it just might be dependent on tubes and cables more than before. I suspect this is because Marshall hooked the switch to the first section of the oscillator and not the second so there is no capacitor to block any DC from the grid switching to ground. 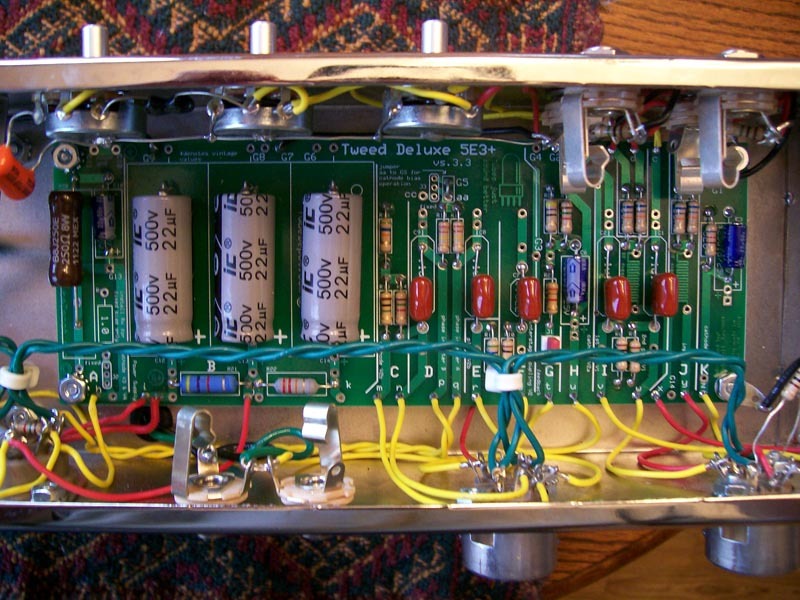 If you look at the Wilson "Dominator" circuit (rumored to be the inspiration for the 18Watt), or the VOX AC15, both of those amps have the tremolo switching circuit on the 2nd stage of the oscillator so that there was at least one capacitor on the grid circuit to block any DC. I know it is heresy but I think Marshall got it wrong. 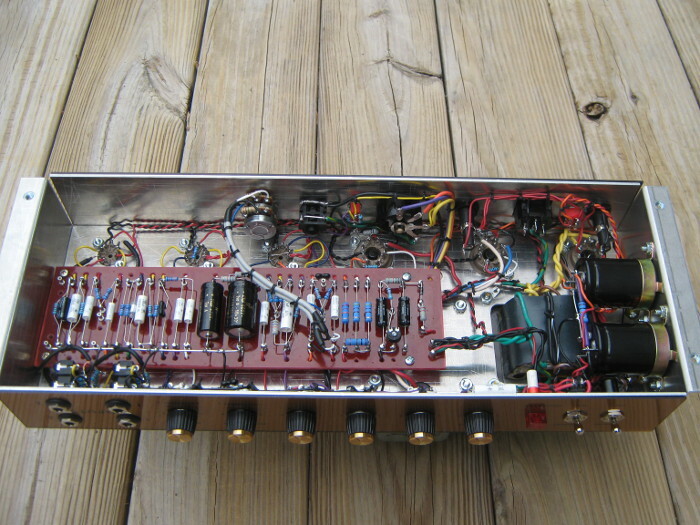 Originally the footswitch was hardwired to the circuit and there are several long "threads' about the capacitance of the cable actually being part of the circuit, in fact the Marshall 18W re-issue has a capacitor wired to the switch jack that is added to the circuit when there is no cable attached. I'm not sure that using the Marshall circuit would work if the switch was added after C7. Since high value resistors (5Meg) are often used in capacitor switching, I'm going to wire one across the foot switch to see if that stops the "thump" when the tremolo is turned off. If it does, I'll wire it across the jack and it will work with either the footswitch or the control switch. Thanks again for a great product, and support. 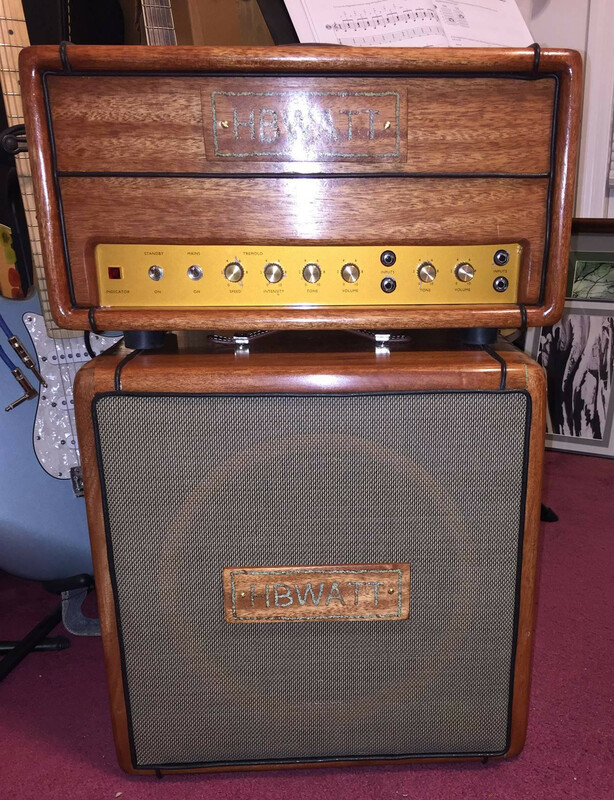 Buy this Classic British 18W Tube Guitar Amp Kit - Head. I completed the 5E3 build and I wanted to let you know I'm very happy with it. I really took my time and tried to do the best build that I could. The cabinet got a couple of coats of shellac to give it an old school vibe. I changed C1 and C2 to .022uf to cut a little low frequency response, I knew that I would be playing some humbucker guitars through it and wanted them to sound good at higher gains...they do! The amp really takes pedals well, right now I'm running a compressor and a tube screamer in and I'm really getting great crunch out of my Les Paul, I'm looking for an analog delay pedal to add that should be tasty.Of course I have the inputs jumped, the interaction between the tone control and the jumped volume controls is very cool. Well I could go on and on, the build went well, I called with one question and you came to the phone and answered it for me, great customer service. I'll be looking to Tube Depot for my next build. How about an analog delay kit? 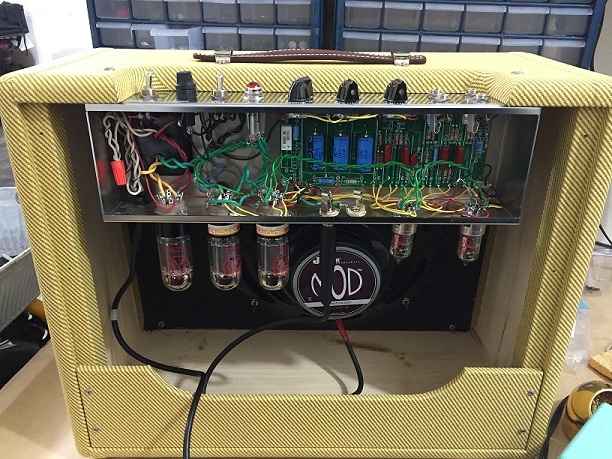 What an awesome amp and a great project. I'm a little bummed it's finished...guess that means I'll just have to do another one. Between the printed instructions and video tutorials (including the "How to Solder" video), the amp went together without any major hiccups. Thanks for your help troubleshooting the few (self-inflicted) minor bugs I had to work through. The amp sounds great...and looks great. If anyone is on the fence about getting one...just do it...you'll be glad you did. The kit is finished! Everything was OK, and it sound awesome! I include some photos of the 5E3, and with the 5F1 I made from you months ago. I had a little trouble with hum issues (more than desirable), but I realize that was the red cable that goes behind the PCB, only move away from OT cables and it fixed. The amp is very silence right now. 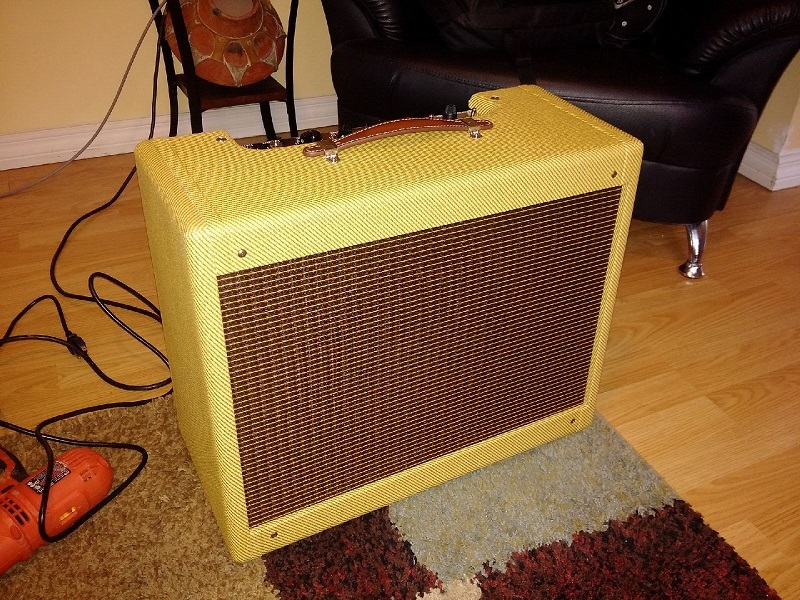 So, I'm going to play again this amazing amp. Thanks again Brian! I finished the amp a few weeks ago and it sounds great. 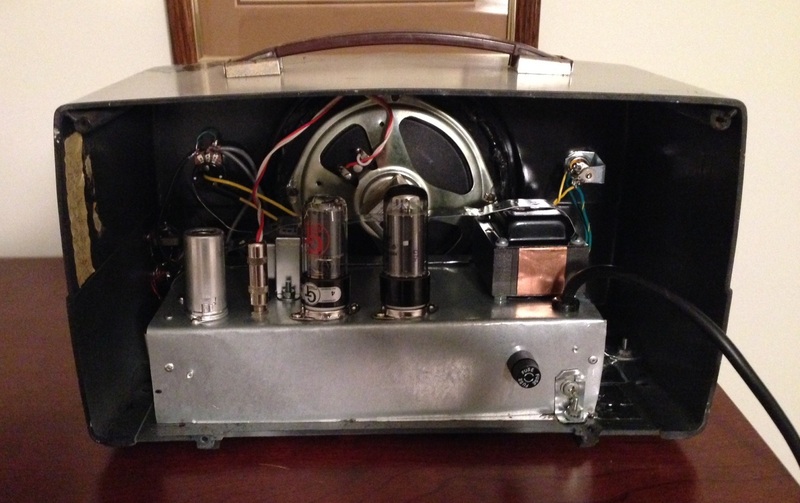 Buy this Tweed 5F1 Vacuum Tube Amp Kit. Just wanted to show off my new tubes I got from you. This is the k-16ls kit from S-5. 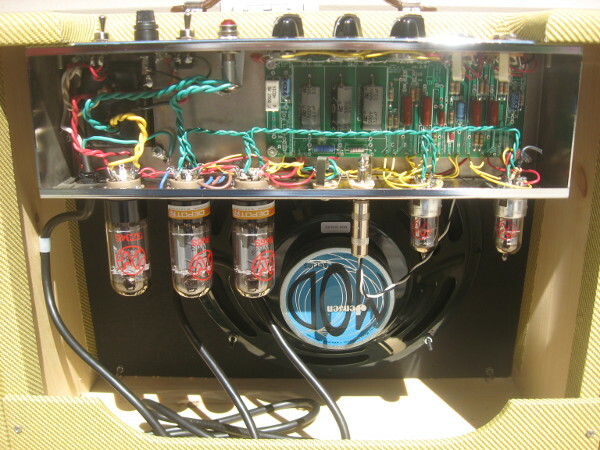 I modded it with the twin tube rectifiers because if you build a tube amp you might as well go all tube. The amp is dead quiet now unlike the ss diode chip that came with it and the sound is eeeeeexcellent! "Real amps glow in the dark!" 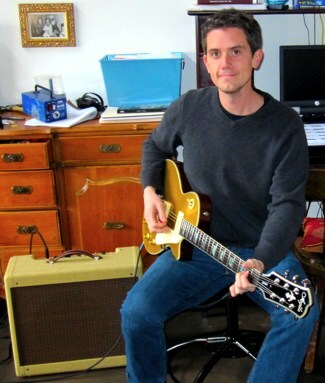 Dear Sir or Madam, I just wanted to let you know I received my Model 16LS Stereo AMP kit on Friday July 29. I assembled it that night and it works great! See the photo. The assembly took 5 hours to complete. It is 100% operational. Thank you! I will be ordering more from you in the future! 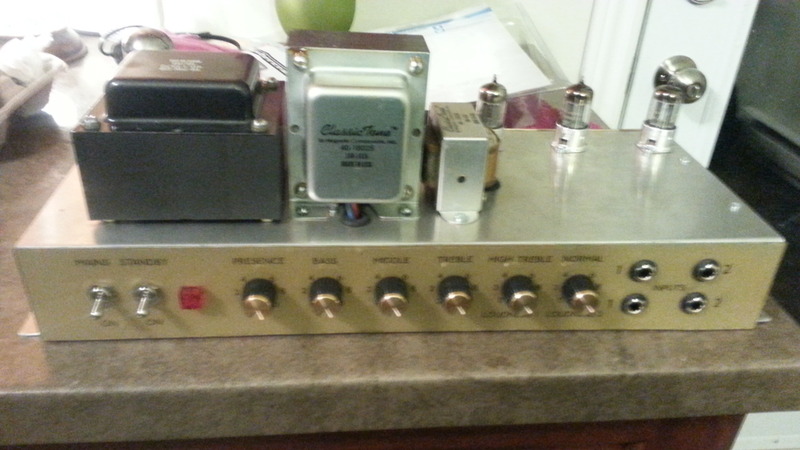 Here are some finished product photos of my amp. All in all I think it's a very good first try. The technical support and custumer service has been first rate. I like the way you make the kit instructions available on line. Reading them plus your assembly video gave me the confidence to try this. I probably never would have otherwise. Providing everything in the kit was also a factor. lYou seem to go very far out of your way to make sure beginners like me know what they are getting themselves into and are successful with their projects. I have already recommended you and your website to a friend. The question now is what kit do I build next? Man everyday that I use this amp I find better ways to use it. 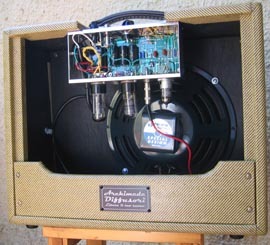 I built the amp its own box so that I can use it as a head that I can plug into a speaker cabinet. When it is plugged into a cabinet it can stretch out and really show me what its capable of. I built the box out of a Brazilian Mahogany, I didn't want a vinyl covered box. I am a die-hard Les Paul player, but I do own a pieced together Stratocaster that I had put together out of a Mid 80's body with late 70's Pickups and other hardware. I like my strat but now that I have this amp it really lets that guitar show its tone and it still sounds great with my Les Paul. 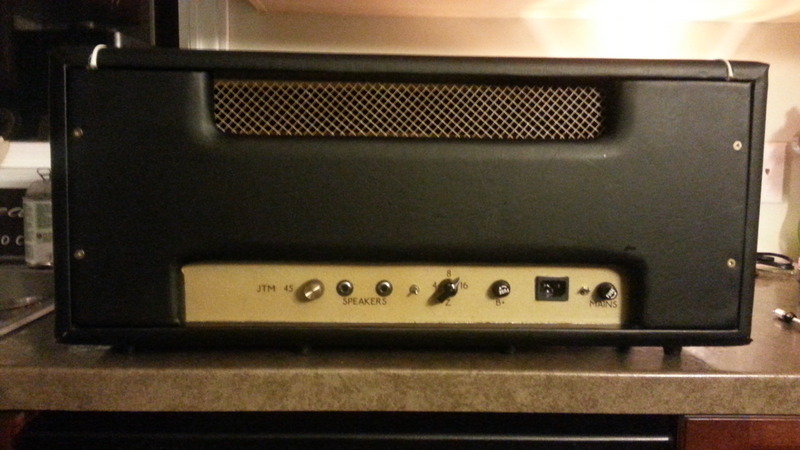 I took some pictures of the finished amp, for you to see. Thanks for making this kit so easy to build, but with quality parts and at a good price. 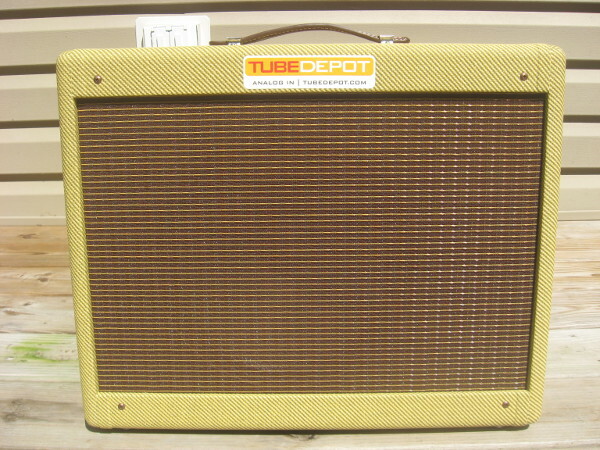 The Tube Depot Tweed 5E3 kit was the first tube amp I have built. I have been building FX pedals for a couple of years now, but I was always intimidated by the potential risks of dealing with high voltages present in tube amps. The Tube Depot kit and its incredible instructions really helped to alleviate some of those fears by walking the builder through the process step by step. The instructions were incredibly well written and easy to follow. There were a couple of occasions when I had additional questions that the instructions did not cover so I just sent an email to Rob H. and had my answer extremely quickly. I finished the build over the course of a long weekend and was beyond impressed with the results. It is a fantastic sounding amp at both bedroom and stage volumes. I've never owned a tube amp that was able to handle all of my dirt pedals so well which makes it ideal for an apartment dweller. On the few occasions I've had to actually crank it up I was blown away...the 6V6 breakup is sublime to my ears. 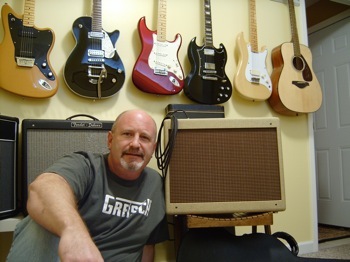 Hi Rob - This amp really went together quickly although I did want to take my time and enjoy the experience. Its been many years since I've done close-in work with a soldering iron. It was lots of fun and I'm kinda sorry it's all finished. Four coats of spray shellac I put on the cabinet helps protect the finish. 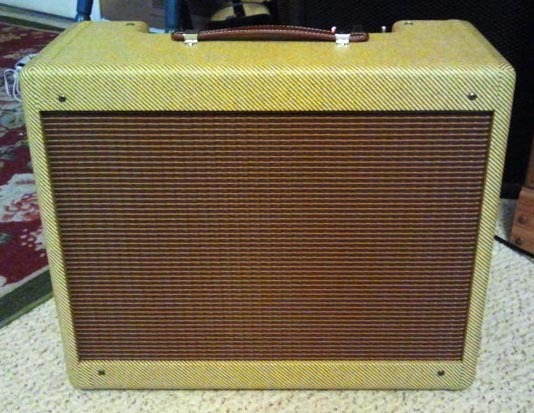 The Tweed 5E3 by Fender is still holding its value around here going for near the $2000 mark or more for the 're-release' and up to $3200 for older models. Replacing v1 with a 12AY7 indeed really cleans up the sound. 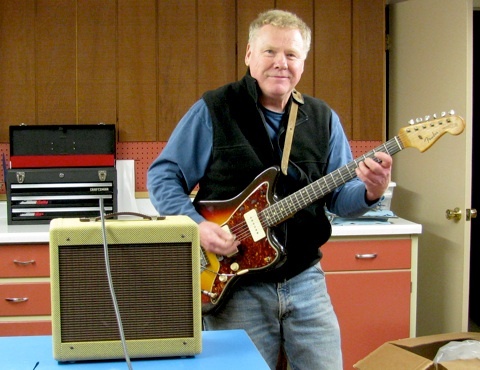 It is great experimenting with the variations between bright and normal channels and different gain guitar pickups, not to mention the variety in pre-amp tubes. I used "quick tabs" on the speaker cable to allow rapid experimentation with different speakers, too. I replaced v1 with the JJ standard 12AX7 and quickly recorded a shuffle using a Strat into the Normal Channel; one single coil Cobalt and a humbucker in the bridge with slight drive and delay. Next I'm going to try the long plate JJ in both v1 and v2. I believe the Russian military tubes in the output section - 5881WXT - (they're about the size of a small blimp), can handle the higher gain pre-amp signal. Very impressive how much the amp rejects 60Hz hum while using single coil PU's and overdrive. Far more quiet than any Fender that I can recall. 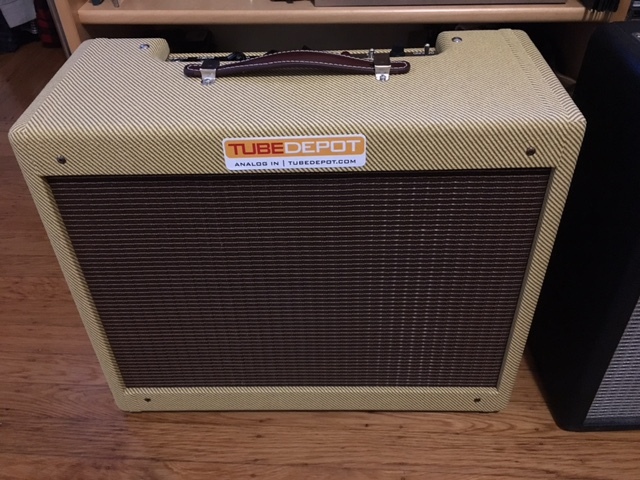 I would recommend this amp to anyone over any of the amps in the Fender Hot Rod series, exceptional tone and seems to be a reliable workhorse. Now if I can only find time to get out and show it off to some folks! It's not easy to find time to play now that the economy is coming back. You can bet I'll make some time now. Thanks again for such a great kit and the tips!! I finished assembling the kit tweed 5E3, have been almost 30 hours. When I went to make the first on his advice, I thought, I have several problems, but I was amazed ... the amplifier and does not have noise, so I plugged the guitar and that's where it came my surprise, it sounds like angels. It was a good buy (and buy the first time outside Spain). 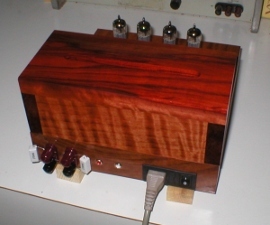 I really enjoyed building my Tweed 5E3 amplifier... This endeavor was my first electronics project and I am completely satisfied with my final product. The build process was surprisingly straight forward, thanks to the comprehensive assembly manual and the informative YouTube videos. Whenever the assembly instructions were unclear, all it took was a quick phone call to the folks at TubeDepot to get things straightened out. 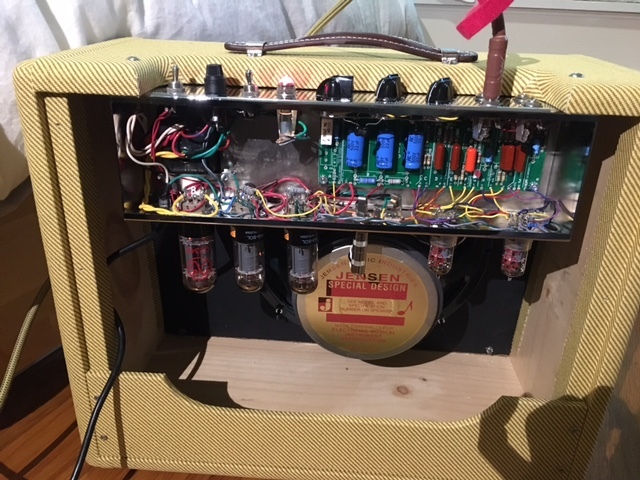 I highly recommend this amplifier kit to anyone who has always wanted their own vintage tube-powered amplifier! I must say that after playing it, it is one of the best sounding amps I have ever heard. My main amp for years now has been the Fender CyberTwin, but this 5F1 certainly fills any void. Congratulations.!!! 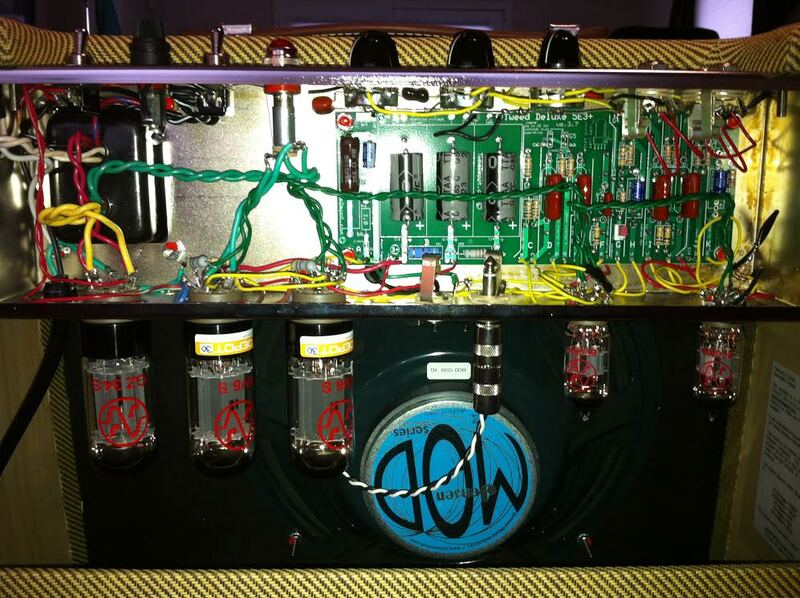 Awesome amp! The well written manual explained everything perfectly. The amp went together quickly with no problems and the finished amp sounds incredible. I'm ready for the next kit. just finished the kit... what a great little monster of tone!!!! 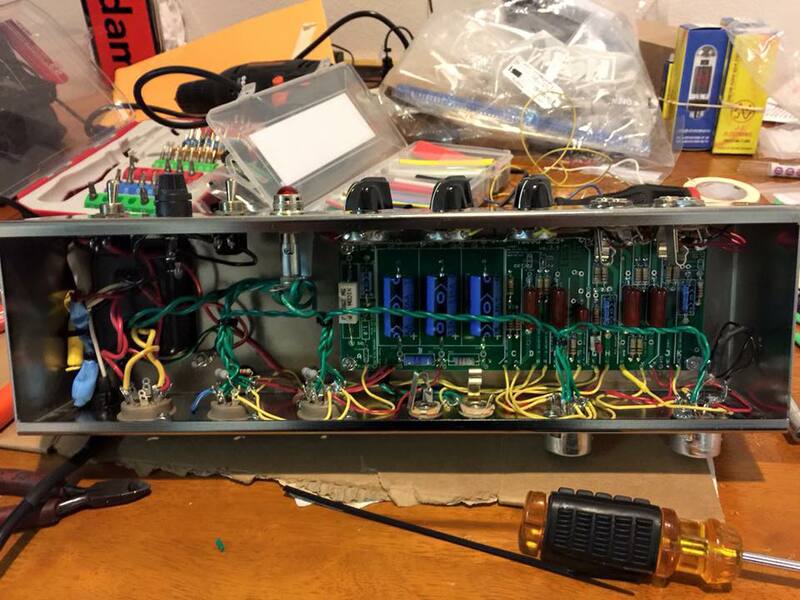 This is my first tube amp full built and I don't know that much about electronics but fortunately everything went right at the first time. Very clear and well explained step by step manual again I tell you how positively impressed I am with the result. I'm wondering if is this addictive!? But most important thing I built it myself!!!!! Ok, you made a really simple and well explained step by step instruction file and that helped me a lot, and your kind support of course, I don't know mutch about electronics. 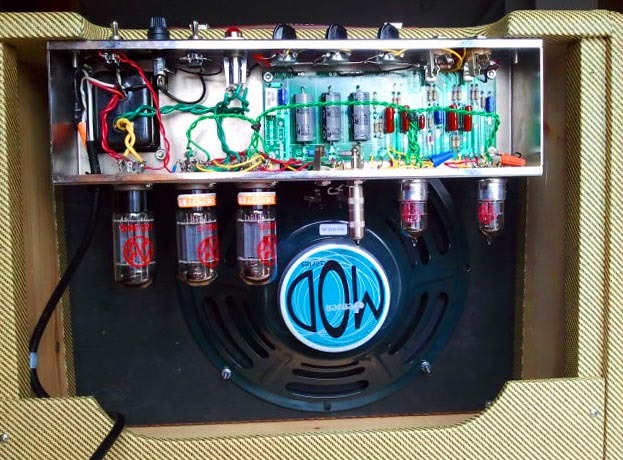 I am a first time amp builder, and I couldn’t be happier with how this project turned out. The instructions were clear and easy to follow. 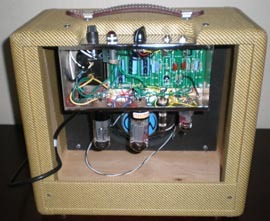 I learned more about tube amps in the few days I worked on this project than I had in twenty years of playing prior. 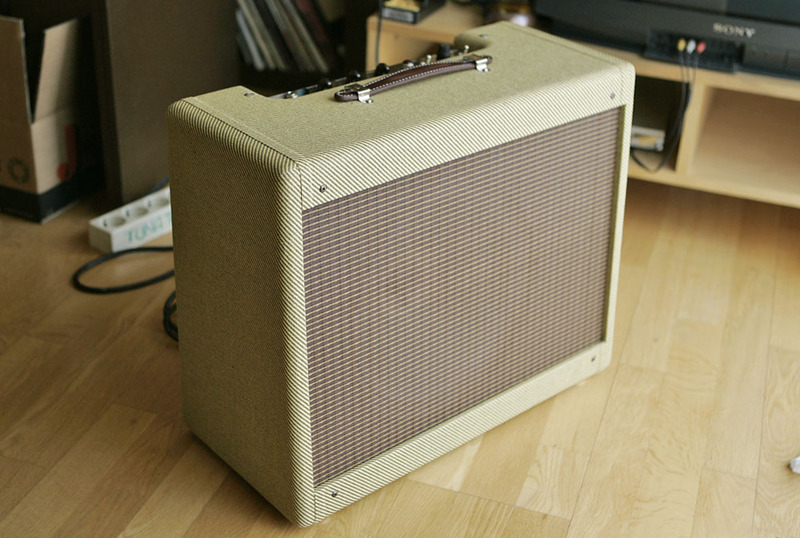 Most importantly, the amp sounds fantastic with a warm, rich tone only a tweed amp can offer. This kit was just plain fun to build! 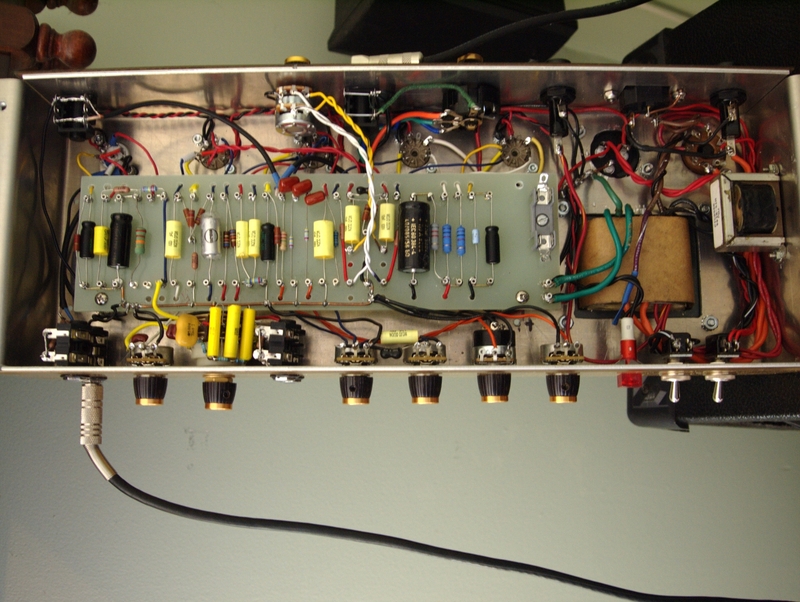 In the end I`d say I`ve learned a bit from building the L16 mono amp and the PL stereo preamp! 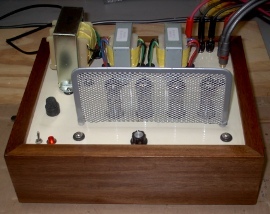 If you`re looking into building a pure tube amp this is it! 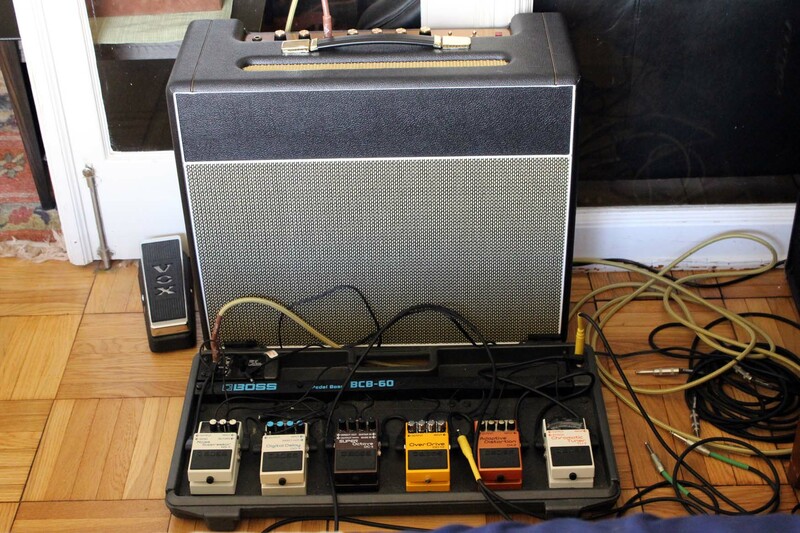 I`m using my L16 amp as a guitar amp with a tiny vintage General Electric preamp as first gain stage. I wired the preamp point to point. Also great customer service from the TubeDepot team. Thanks guys! 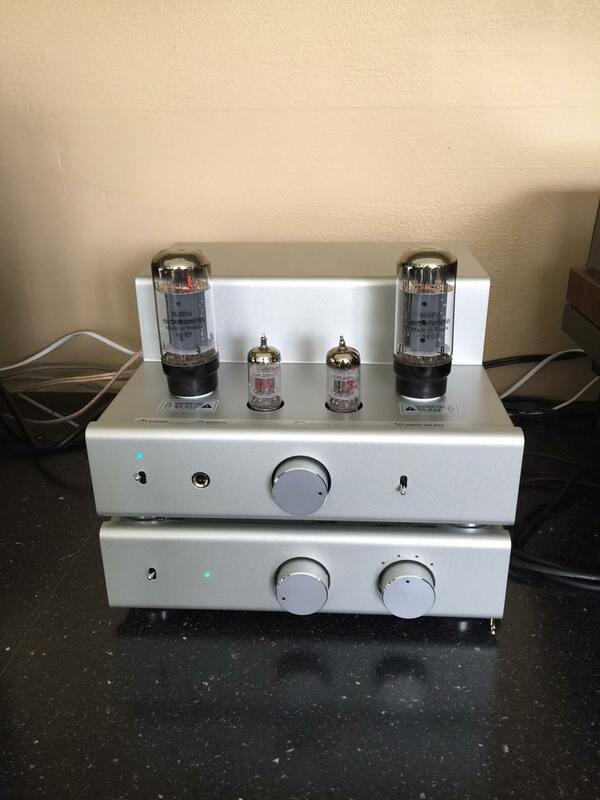 Buy this Mono Tube Amplifier Kit. 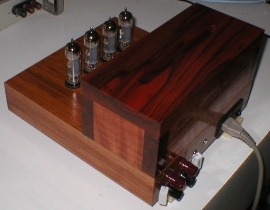 My K12M kit was built with some modifications, and was given a beautiful chassis of wood. The electronics were modified. I removed the global feedback and the input pots. The input pots were replaced with 2k fixed resistors (opamp preamps will handle this just fine) and the output pentode long tail pair resistors were replaced with LM317 current sources. 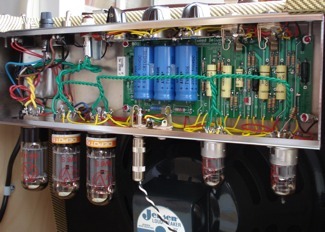 The low input resistance was necessary to keep the amp from oscillating, which it also did with the factory wiring with the pots set to maximum. The result was a drop in distortion from over 1% to 0.23% just below the clipping point of 5W, and no oscillation. A small DC fan was also added to keep the transformers cool; the fan was set to a lower voltage than specified to keep the noise below the audibility threshold at a distance. The line connection to the power supply is thermostatically controlled with a passive reed switch-like device in case the fan fails. The chassis was made of solid mahogany (recycled from a commercial dumpster), so the wood grain can be seen over every edge. The transformers were covered with wood also. The cover is made of bloodwood on top (which is slotted for ventilation), figured redwood on the sides, and manzanita root burl on the edges. I collected the manzanita myself from the wild. The chassis is worth far more than the electronics! Tubes are a work of art, so the wood is right in line. 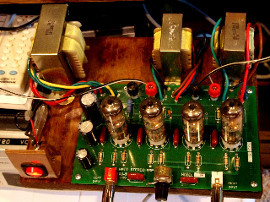 Buy this Stereo Tube Amplifier Kit. 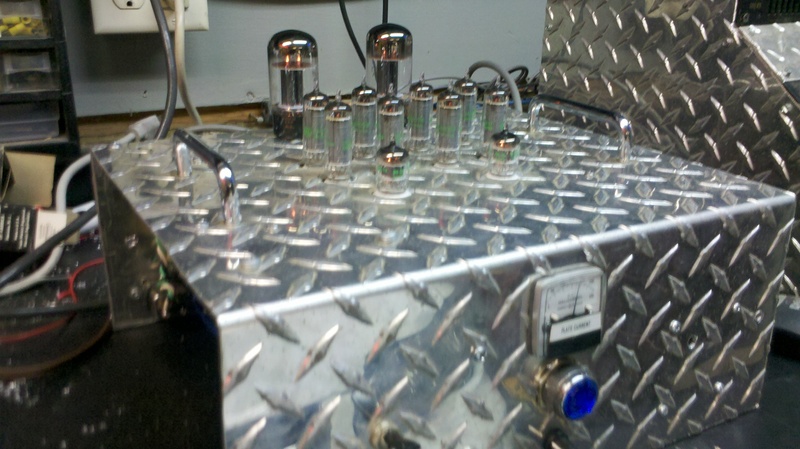 Here are some pictures of my k12m Stereo Tube Amplifier Kit. I made the base from dark smoke 1/4" plexiglass, the top and bottom were made from 1/16" brushed aluminum stock and the protection posts are polished brass spacers (image 1). Later I made some modifications to solve 2 problems (image 2). Problem #1 was the heat radiated to the top plate by the tubes made the inside of the case hot!, also the transformers were being overheated, as well as the bottom of my turntable's glass shelf. I raised the top panel 3/16" with rubber grommets at the 4 mounting screws, I also punched four 1/2" holes on the bottom plate in order to create a convection cooling system (the heat raising from the top plate draws cool air from the bottom through the the holes on the bottom plate) to keep the PC boards and the components inside the case Cool. I also added a right angle heat deflection plate between the transformers an the tubes, the vertical backplate has a plate of copper spaced from the aluminum by two 1/4" spacers, this modification also fix problem #2, (shielded the tubes from the electromagnetic field of the transformers inducing 60 Hz hum). 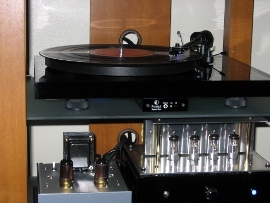 The amp performs very good with my home made tube phono preamp and my Project turntable. 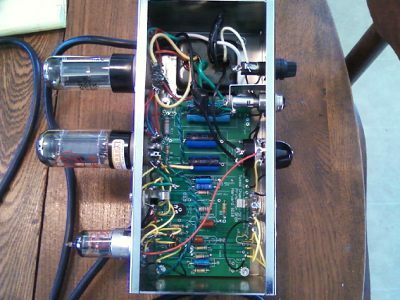 I am glad that someone created this affordable tube amp kit that works as good or better than other tube amps costing 10 to 20 times more $$$$$. 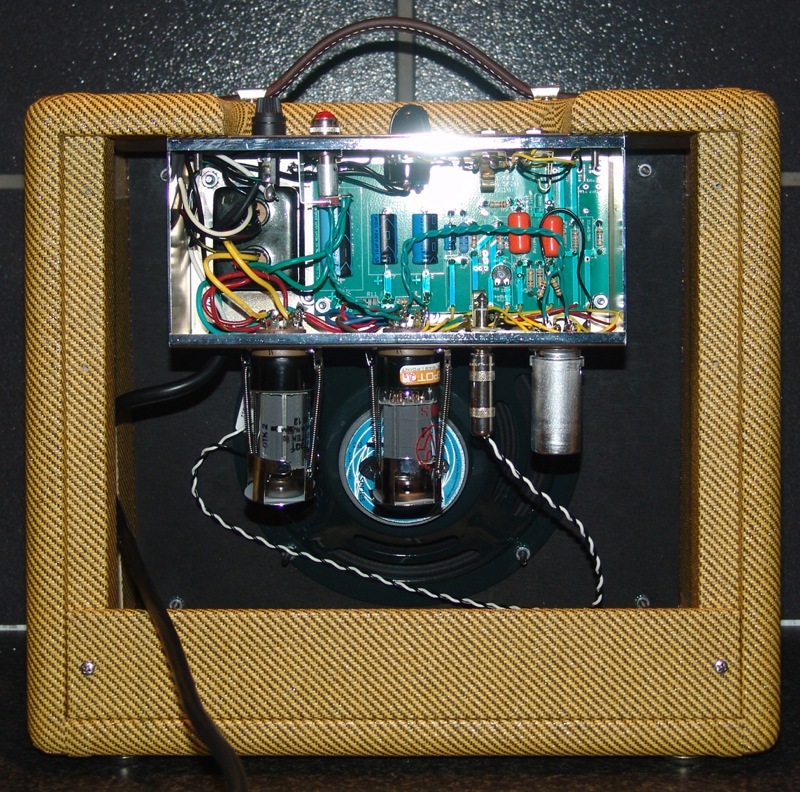 My DIY-K12m Stereo Tube Amplifier has been in continuous use for 12 hours a day since I built it 3 years ago. 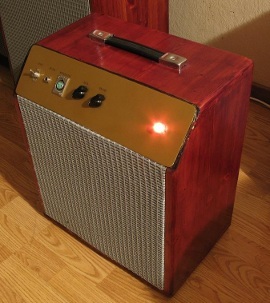 I wanted a vintage style amp to complement my mid-century decor, so I custom designed my box and featured the tubes. It was a real pleasure working on it, and simple to put together. The amp is a great conversation piece and sounds great! This is one of the kits I built. So far 3 unit where built in this fashion, and have orders for 2 more. This unit has all the updates, Solen caps and dc filament, small choke in the power-supply, sub woofer output. 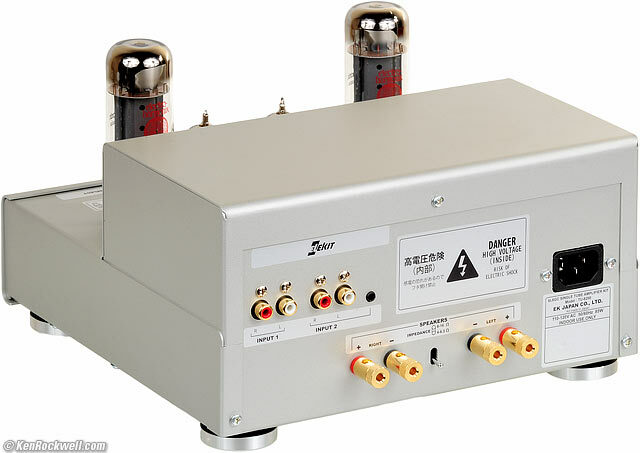 Owners of thousand dollar units are the ones that are placing orders for this amp, after hearing the sound knocked them off their feet. 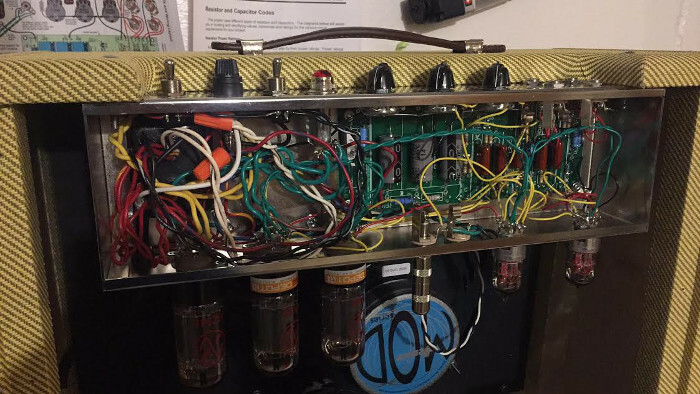 Robert A. did not provide us with a written review, but he was kind enough to include these photographs of his amplifier kit.